Footprints in the Butter: Finally! A blog contest where I can compete!! My friend Lori has an awesome blog post today. I swear she's been listening in on my schooling when she created these prize-winning blogger categories. or maybe I am royalty... The Queen of Misfits! I don't know. Maybe tomorrow I can decide what to nominate myself for. And you can go nominate yourself (or me! I DO have a sense of humor!!) too. I'll vote for you -lol! 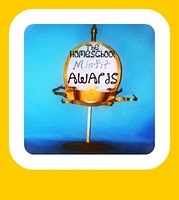 For my homeschool blog, I'm definitely entering the Misfit Blogger award! I have not started to think about who I will nominate over there. I have to get through TODAY first... Life WILL be easier tomorrow. These are fun awards, and I too entered for the WannaBe Award, and Queen of Misfits. LOL!! I'm with you on fitting in several of the categories. So, when's that saving money on grocery shopping while making sure the family doesn't starve post coming ;o) My boys think me mad, but I did a big happy dance when BlogSpark asked if I'd do a Fiber One review and giveaway that included a $25 gift card to Safeway. It stinks that the price of the Fiber One products are more than the free coupon covers, but such is life up in Alaska. You are so funny! Somehow I didn't see this earlier. Tess -- well, I nominated you! As promised. Nominated most everyone who commented on this post, actually.